VANCOUVER, Jan. 13, 2019 /CNW/ - Filo Mining Corp. (TSX-V, Nasdaq First North: FIL) ("Filo Mining", or the "Company") is pleased to announce the results of a positive Pre-Feasibility Study ("PFS") at its 100% owned Filo del Sol project located on the border of Region III, Chile and San Juan Province, Argentina. A conference call and webcast to discuss these results will be held on Tuesday, January 15, 2018 at 09:00 h Eastern Standard Time. All values in this release are reported in US dollars. Commenting on the results, CEO Adam Lundin stated, "The PFS confirmed and improved on our initial work at Filo del Sol and highlights the incredible potential of the project. We remain excited about our ongoing field season that will continue to enhance the project and in tandem explore the sulphide portion of the deposit which, to date, has not been included in any study or economics." 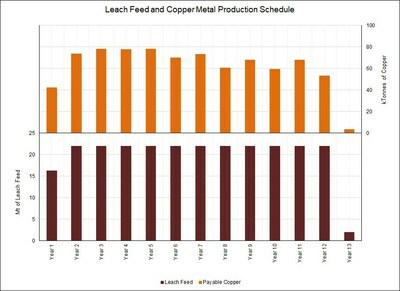 14 year mine life (including pre-stripping) producing almost 1.75 billion pounds (lbs) of copper as cathode, and 1.92 million ounces (oz) of gold and 104 million oz of silver as doré over the 13 year leach feed schedule. Additional copper is also recovered as a high-grade copper precipitate. Excellent metallurgy producing LME grade copper cathodes and gold and silver doré. Future exploitation of copper-gold sulphide material underlying the identified oxide deposit. Filo del Sol hosts a high-sulphidation epithermal copper-gold-silver deposit associated with a large porphyry copper-gold system. The project is located in the Andes Mountains on the border of Chile and Argentina, approximately 140 km southeast of the city of Copiapó. The project is covered under the Mining Integration and Complementation Treaty between Chile and Argentina, which provides the framework for the development of cross-border mining projects. The PFS contemplates that Filo del Sol would be mined using conventional open pit methods. From the open pit, ore would be trucked to a conventional two-stage crusher, designed to process 60,000 tonnes per day of ore. Crushed ore would be treated by sequential heap leaching, to extract copper and subsequently gold and silver from the ore followed by hydrometallurgical processing to produce copper cathodes and gold-silver doré. Groundwater for the process plant would be supplied from nearby aquifers to the plant site, and power would be supplied via 127 km of power line construction to connect to the Chilean national grid. Copper cathode and gold-silver doré would be transported by truck to Puerto Caldera which is located approximately 245 km by road from the plant site. Approximately 60 km of the existing road between site and port would require upgrade to accommodate the truck traffic; the remaining distance comprises public highway. *All figures reported are in 2018 US dollars and on a 100% Project and 100% equity basis valuation. 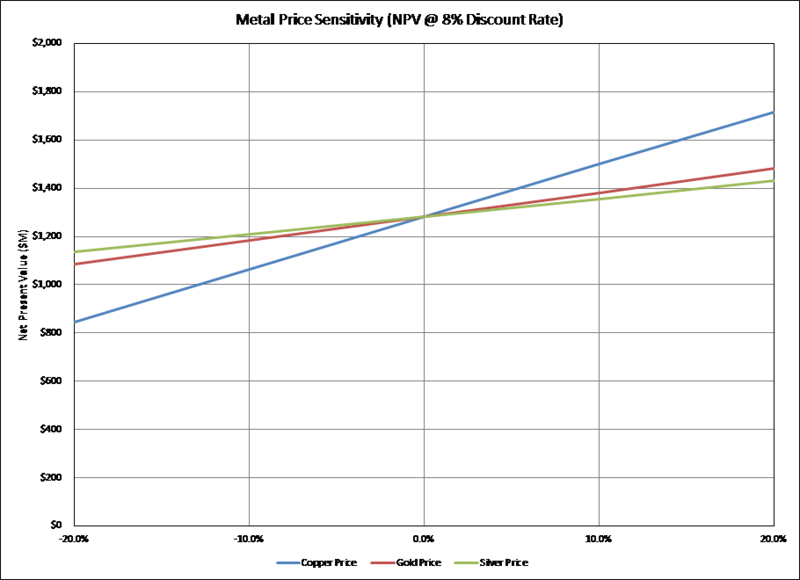 Copper price shown excludes a 1.5% cathode premium which was included in the economics. Argentine revenue includes a 3% provincial mining royalty and 25% corporate tax rate. Chilean revenue includes a 1.5% private NSR royalty, a 27% corporate tax rate, and the Chilean Mining Tax. The estimated overall effective corporate tax rate for the project is 26.4%. The PFS was prepared and managed by Ausenco Engineering Canada Inc. ("Ausenco"), with input from AGP Mining Consultants (Canada), BGC Engineering (Canada), Knight Piésold (Canada), Advantage Geoservices Limited, Merlin Geosciences Inc., and SRK Consulting (Canada). A NI43-101 Technical Report that summarizes the results of the PFS and incorporates the initial reserve statement for Filo del Sol will be filed within 45 days on SEDAR and on the Company's website. A cash flow valuation model for the project has been developed based on the PFS. The model was developed using a long-term copper price of $3.00/lb, gold price of $1,300/oz, and silver price of $20/oz. 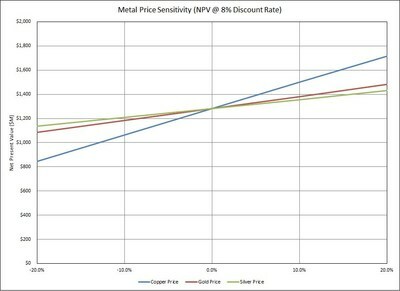 The following figure shows the sensitivity of estimated NPV for the Project's cash flow at various changes to metal prices at 8% discount rate. Capital costs were derived from a variety of sources including derivation from first principles, equipment quotes and factoring from other costs contained within the PFS study. Costs are estimated to an accuracy of +/- 25% which is equivalent to an AACE International, Class 4 Estimate. The PFS estimates that the C1 cash costs (co-product basis) over the life of mine will average $1.23/lb CuEq. C1 cash costs include at-mine cash operating costs, treatment and refining charges, royalties, selling costs, and transportation costs and are reported on a $/equivalent payable unit of the primary metal. The Initial Mineral Reserve estimate for Fil del Sol, shown below, is based on the Mineral Resource Statement with an effective date of June 11, 2018 (see the news release titled "Filo Mining Reports Updated Mineral Resource Estimate for the Filo del Sol Project" dated August 8, 2018 and available under the Company's profile on SEDAR). The Mineral Resources are inclusive of Mineral Reserves. Mineral Reserves have an effective date of 13 January 2019. The Qualified Person for the estimate is Mr. Jay Melnyk, P.Eng. of AGP Mining Consultants, Inc.
All figures are rounded to reflect the relative accuracy of the estimate. Totals may not sum due to rounding as required by reporting guidelines. The study contemplates open pit mining methods, with conventional drilling, blasting and loading performed on 12m benches. Autonomous haulage was incorporated to take advantage of the technology's proven productivity improvements and operating cost savings. The open pit would have a mine life of 14 years, including pre-stripping, with a life of mine strip ratio of 1.5:1. A maximum mining rate of approximately 65 Mt per year (including waste) is required to provide the nominal 60,000 tonnes per day of ore to the process facility. A total of 259 Mt of ore is expected to be processed over the life of the mine. Ore would be trucked from the mine and either stockpiled or direct tipped into the primary crusher. The ore would be further crushed through a closed-circuit secondary crushing system to a stockpile. Crushed ore would be processed at an on/off heap leach pad where the copper would be leached in acid and then recovered from the leach solution by solvent extraction and electrowinning to produce LME grade copper cathodes. Metal leaching is expected to span over 13 years. Once the copper is leached, the ore would be rinsed, neutralized and removed from the on/off leach pad by a bucket wheel reclaimer. The material would then be agglomerated using cement, and subsequently stacked on a permanent heap leach pad where gold and silver would be leached in a cyanide solution. Gold and silver would be recovered from the pregnant gold leach solution by a Merrill-Crowe zinc precipitation process. Gold and silver would then be smelted to produce doré. A portion of the barren leach solution, following zinc precipitation, would be treated to avoid a build-up of recirculating copper and cyanide through the gold circuit. This treatment is based on the SART process which produces a copper sulphide precipitate (which grades approximately 65% copper) and recovers cyanide for use in the heap leach. 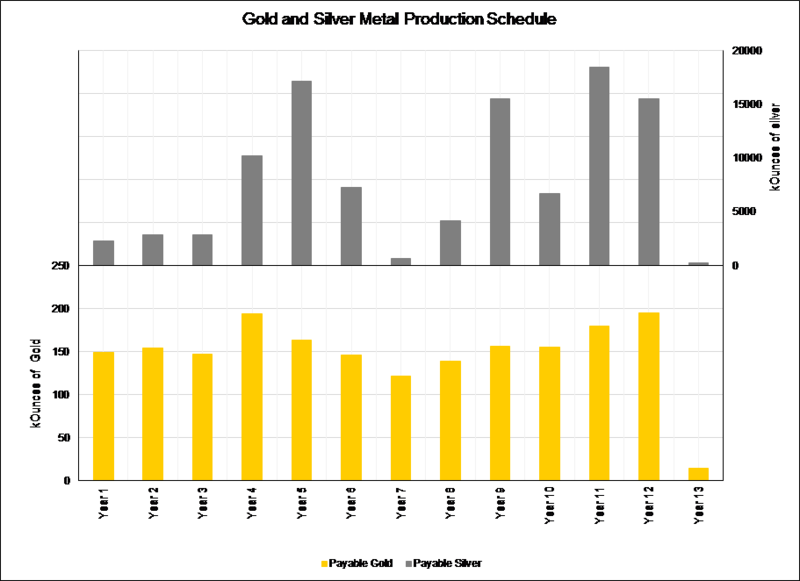 The proposed PFS production schedule and metal production profile is shown in the attached figures. Note: the project assumes a 24-month construction period. In 2016 and 2017, comprehensive metallurgical test programs were carried out at SGS Lakefield on selected samples from the Filo del Sol deposit. These focussed mostly on assessing the feasibility of using heap leaching to recover the copper, gold and silver from the various mineralization types identified. To confirm these results a sampling campaign was carried out in early 2018 to collect surface samples, RC chips and diamond drill core samples. A total of more than 3,500 kg of sample was shipped to the SGS facility in Lakefield, Ontario. Samples were submitted to various physical, chemical and detailed mineralogical characterisation tests. Most of the metallurgical program was devoted to the leaching stage of the process, more particularly heap leaching. Heap leaching was simulated by conducting column leaching tests on material ranging from 0.5 to 2.5 inch crush size and using 50 to 250 kg of sample per column test. Cyanide column leaching was tested for the gold oxide ore types (a total of 11 column tests), while sequential column leaching (acid leaching followed by washing/neutralization and cyanide leaching) was used for the copper-gold oxide ore types (a total of 18 sequential column tests). Variability and process optimization testing were carried out using bottle roll tests on minus 10 mesh material. Both cyanide leaching (a total of 21 bottle roll tests) and sequential leaching (a total of 72 sequential leach bottle roll tests) were conducted during the 2018 program. The results of the test program were used to determine the optimal leach program together with expected leach recoveries for copper, gold and silver. 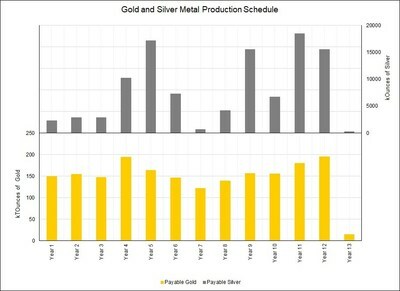 Additionally, deductions to the testwork extractions were applied to expected copper, gold, and silver recoveries to simulate scale-up to a commercial production facility. Water Supply: Water would be supplied from aquifers in Argentina, located near the proposed plant site. The industrial water make-up requirement is estimated to be 75 L/s and is expected to be fully supported by the aquifers. Power Supply: The site would be supplied with electricity through a 127 km long, 110 kV, single circuit power transmission line connected to the Los Loros substation in Chile. Average electrical demand is estimated to be 52 MW. A price of $0.075/kWh was used for long-term power supply. Product Transport: Copper cathode would be transported by truck to Puerto Caldera, a port near the city of Caldera which is located 77 km by road northwest of Copiapó. The approximate trucking distance from the plant site is 245 km, of which roughly 60 km of existing road will require upgrade to accommodate the truck traffic. Doré would be transported approximately 175 km to Aeropuerto Desierto de Atacama for ongoing airfreight. Knight Piésold completed the environmental baseline work for the Company in 2017 and 2018 in addition to reviewing the historical work from other independent consultants who assisted in the preparation of the environmental work. This work will be used to support the preparation of the respective Environmental Impact Assessments ("EIA"). Baseline studies to date include geosciences, air & water, terrestrial biota, the human environment, and natural & cultural heritage. The list of environmental components to be studied was derived from the Chilean national environmental assessment regulations, the Argentine national mining environmental law and from the International Finance Corporation's Sustainability Performance Standards (IFC 2012). Baseline studies are ongoing and will continue into the upcoming field season. Communication with the local community, private land owners, and other interested parties is also ongoing. The Filo del Sol Resource remains unchanged from the Mineral Resource estimate reported by the Company on August 8, 2018 and is based on a total of 44,600 metres of drilling in 188 holes, of which 158 holes are reverse circulation (RC) and 30 holes are core holes. The resource estimate presented below is the total Indicated and Inferred Resource, divided between oxide and sulphide mineralization. The Mineral Resource estimate as of the effective date of June 11, 2018 is shown in the table below. The Mineral Resources are inclusive of Mineral Reserves. Mineral Resources that are not Mineral Reserves do not have demonstrated economic viability. Cutoff grades are 0.2 g/t Au for the AuOx material, 0.15% CuEq for the CuAuOx material and 20 g/t Ag for the Ag material. These three mineralization types have been amalgamated in the Oxide total above. CuAuOx copper equivalent (CuEq) assumes metallurgical recoveries of 82% for copper, 55% for gold and 71% for silver based on preliminary metallurgical testwork, and metal prices of US$3/lb copper, US$1300/oz gold, US$20/oz silver. The CuEq formula is: CuEq=Cu+Ag*0.0084+Au*0.4239. The following Qualified Persons will co-author the technical report that will be based on the PFS. These QPs have approved the information in this news release that pertain to the sections of the PFS technical report that they are responsible for. Geology: Fionnuala Devine, P.Geo., of Merlin Geosciences Inc.
Metallurgy: Robin Kalanchey, P.Eng., of Ausenco Engineering Canada Inc. Processing: Robin Kalanchey, P.Eng, of Ausenco Engineering Canada Inc.
Infrastructure: Scott Elfen, P.Eng, of Ausenco Engineering Canada Inc.
Each of the individuals above are independent QP's for the purposes of NI 43-101. All scientific and technical information in this press release in respect of the Filo del Sol project or the PFS is based on information prepared by or under the supervision of those individuals. A conference call and webcast to discuss the PFS results will be held on Tuesday, January 15th, 2018 at 09:00 Toronto time, 14:00 UK time, or 15:00 Swedish time. 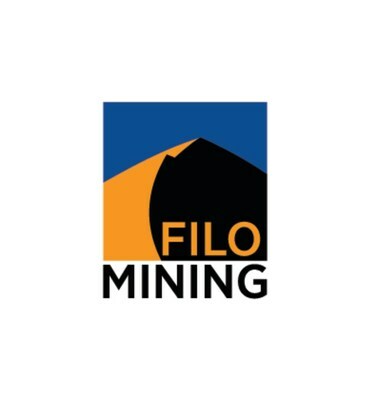 The presentation slideshow will also be available in PDF format for download from the Filo website www.filo-mining.com before the conference call. A replay of the telephone conference will be available approximately 2 hours after the completion of the conference call until February 15, 2019 at 11:59 PM EST. Effective as of January 12, 2019, the Company has entered into a US$5,000,000 credit facility (the "Facility"), which will be evidenced by a debenture (the "Debenture"), to provide additional financial flexibility to fund the Company's ongoing work programs and provide general working capital. The Facility has a term of 18 months ending July 12, 2020 (the "Maturity Date"). No interest is payable during the term of the Debenture, however, any amount of the Facility remaining unpaid and outstanding on or after the Maturity Date shall bear interest at a rate of 5.00% per annum until repaid in full. The Facility has been issued by Zebra Holdings and Investments S.à.r.l. (the "Lender"), a company controlled by a trust settled by the late Adolf H. Lundin, and an insider of the Company. The terms of the Facility include the Company issuing to the Lender, 300 Common Shares per month for each US$50,000 of the Facility outstanding from time to time up to the Maturity Date. All securities issued in conjunction with the Facility will be subject to a four-month hold period under applicable securities law. The Facility replaces a previous US$2,000,000 credit facility provided by the Lender, and which matured on January 12, 2019. The outstanding balance owing to the Lender under the previous facility, as of the maturity date, has been transferred and forms part of the amount owing under the new Facility. The Common Shares to be issued pursuant to the terms of the Debenture will be issued at a deemed price of CA$2.20 per share. The issuance of Common Shares to an insider and the entering into of the Debenture each constitute a "related party transaction", as defined under Multilateral Instrument 61-101 ("MI 61-101"). The transactions will be exempt from the formal valuation and minority shareholder approval requirements of MI 61-101 as neither the fair market value of any shares issued to, or the consideration paid for, the Debenture will exceed 25% of the Company's market capitalization. Filo Mining is a Canadian mineral mining company focussed on advancing the Company's key project, Filo del Sol. The Company's shares are listed on the TSX-V and on Nasdaq First North under the symbol "FIL". Filo Mining is a member of the Lundin Group of Companies. The Company's focus is advancing development of its 100% owned Filo del Sol copper/gold deposit located in Chile's Region III and adjacent San Juan Province, Argentina. This information is information that Filo Mining Corp. is obliged to make public pursuant to the EU Market Abuse Regulation. The information was submitted for publication, through the agency of the contact person set out below, on January 13, 2018 at 9:00 p.m. Pacific Time. Certain statements made and information contained herein in the news release constitutes "forward-looking information" and "forward-looking statements" within the meaning of applicable securities legislation (collectively, "forward-looking information"). The forward-looking information contained in this news release is based on information available to the Company as of the date of this news release. Except as required under applicable securities legislation, the Company does not intend, and does not assume any obligation, to update this forward-looking information. Generally, this forward-looking information can frequently, but not always, be identified by use of forward-looking terminology such as "plans", "expects" or "does not expect", "is expected", "budget", "scheduled", "estimates", "forecasts", "intends", "anticipates" or "does not anticipate", or "believes", or variations of such words and phrases or statements that certain actions, events, conditions or results "will", "may", "could", "would", "might" or "will be taken", "occur" or "be achieved" or the negative connotations thereof. All statements other than statements of historical fact may be forward-looking statements. Forward-looking statements contained in this news release include statements regarding the results of the PFS and the anticipated capital and operating costs, sustaining costs, net present value, internal rate of return, payback period, process capacity, average annual metal production, average process recoveries, anticipated mining and processing methods, proposed PFS production schedule and metal production profile, anticipated construction period, anticipated mine life, expected recoveries and grades, expected SART recovery and cost savings, anticipated production rates, infrastructure, social and environmental impact studies, availability of labour, tax rates and commodity prices that would support development of the Filo del Sol Project. Information concerning mineral resource/reserve estimates and the economic analysis thereof contained in the results of the PFS are also forward-looking statements in that they reflect a prediction of the mineralization that would be encountered, and the results of mining, if a mineral deposit were developed and mined. Although Filo Mining believes that the expectations reflected in such forward-looking statements and/or information are reasonable, undue reliance should not be placed on forward-looking statements since Filo Mining can give no assurance that such expectations will prove to be correct. Additionally, this press release contains forward-looking statements or information with respect to the anticipated use of proceed from the Facility, the ability of the Company to satisfy the conditions of the Debenture including repayment of the Facility upon its maturity and the issuance of shares thereunder, and the timing and success in obtaining requisite regulatory approvals. These statements involve known and unknown risks, uncertainties and other factors that may cause actual results or events to differ materially from those anticipated in such forward-looking statements, including the risks, uncertainties and other factors identified in Filo's periodic filings with Canadian securities regulators, including the Company's Annual Information Form available under the Company's profile at www.sedar.com. In addition, these statements involve assumptions made with regard to the Company's ability to develop the Filo del Sol Project and to achieve the results outlined in the PFS; the ability to raise the capital required to fund construction and development of the Filo del Sol Project; and the results and impact of future exploration at Filo del Sol. Statements relating to "mineral resources" are deemed to be forward-looking information, as they involve the implied assessment, based on certain estimates and assumptions that the mineral resources described can be profitably produced in the future. The forward-looking statements contained in this news release are made as at the date of this news release and Filo does not undertake any obligations to publicly update and/or revise any of the included forward-looking statements, whether as a result of additional information, future events and/or otherwise, except as may be required by applicable securities laws. Forward-looking information is provided for the purpose of providing information about management's current expectations and plans and allowing investors and others to get a better understanding of the Company's operating environment. Forward-looking information is based on certain assumptions that the Company believes are reasonable, including that the current price of and demand for commodities will be sustained or will improve, the supply of commodities will remain stable, that the general business and economic conditions will not change in a material adverse manner, that financing will be available if and when needed on reasonable terms and that the Company will not experience any material labour dispute, accident, or failure of plant or equipment. These factors are not, and should not be construed as being, exhaustive. Although the Company has attempted to identify important factors that would cause actual results to differ materially from those contained in forward-looking information, there may be other factors that cause results not to be as anticipated, estimated, or intended. There can be no assurance that such statements will prove to be accurate, as actual results and future events could differ materially from those anticipated in such statements. All of the forward-looking information contained in this document is qualified by these cautionary statements. Readers are cautioned not to place undue reliance on forward-looking information due to the inherent uncertainty thereof. Information regarding reserve and resource estimates has been prepared in accordance with Canadian standards under applicable Canadian securities laws, and may not be comparable to similar information for United States companies. The terms "Mineral Resource", "Measured Mineral Resource", "Indicated Mineral Resource" and "Inferred Mineral Resource" used in this news release are Canadian mining terms as defined in accordance with NI 43-101 under guidelines set out in the Canadian Institute of Mining, Metallurgy and Petroleum ("CIM") Standards on Mineral Resources and Mineral Reserves adopted by the CIM Council on May 10, 2014. While the terms "Mineral Resource", "Measured Mineral Resource", "Indicated Mineral Resource" and "Inferred Mineral Resource" are recognized and required by Canadian regulations, they are not defined terms under standards of the United States Securities and Exchange Commission. Under United States standards, mineralization may not be classified as a "reserve" unless the determination has been made that the mineralization could be economically and legally produced or extracted at the time the reserve calculation is made. As such, certain information contained in this news release concerning descriptions of mineralization and resources under Canadian standards is not comparable to similar information made public by United States companies subject to the reporting and disclosure requirements of the United States Securities and Exchange Commission. An "Inferred Mineral Resource" has a great amount of uncertainty as to its existence and as to its economic and legal feasibility. It cannot be assumed that all or any part of an "Inferred Mineral Resource" will ever be upgraded to a higher category. Under Canadian rules, estimates of Inferred Mineral Resources may not form the basis of feasibility or other economic studies. Readers are cautioned not to assume that all or any part of Measured or Indicated Resources will ever be converted into Mineral Reserves. Readers are also cautioned not to assume that all or any part of an "Inferred Mineral Resource" exists or is economically or legally mineable. In addition, the definitions of "Proven Mineral Reserves" and "Probable Mineral Reserves" under CIM standards differ in certain respects from the standards of the United States Securities and Exchange Commission. This news release refers to certain financial measures, such as pre-production capital costs, initial capital expenditures, sustaining capital expenditure, closure costs, C1 cash costs, payback period, undiscounted after-tax cash flow, and net present value, and other financial metrics which are not measures recognized under IFRS and do not have a standardized meaning prescribed by IFRS. In the mining industry, these are common performance measures but may not be comparable to similar measures presented by other issuers. The Company believes that, in addition to conventional measures prepared in accordance with IFRS, certain investors use this information to evaluate the Company's performance and ability to generate cash flow. Accordingly, it is intended to provide additional information and should not be considered in isolation or as a substitute for measures of performance prepared in accordance with IFRS. Return to the 2019 list.